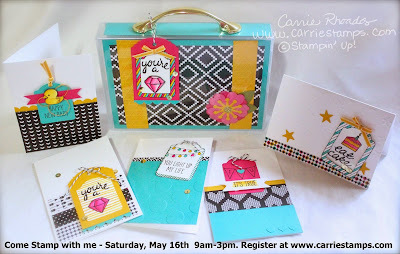 This was my last class with the stamp case handle project. We are loving this so much! This one is similar to the other one I posted, just changed up the colors to Lost Lagoon and Sahara Sand with Typeset Specialty Designer Series Paper. All created with the Butterfly Basics Bundle. My stamp clubs ended this month and I gave them all a thank you stamp as a token of my appreciation for our 9 months together. We will start up again in September if anyone local to the area is interested. If you are in or around the Boise, Idaho area, here is a fun stamping opportunity for you. 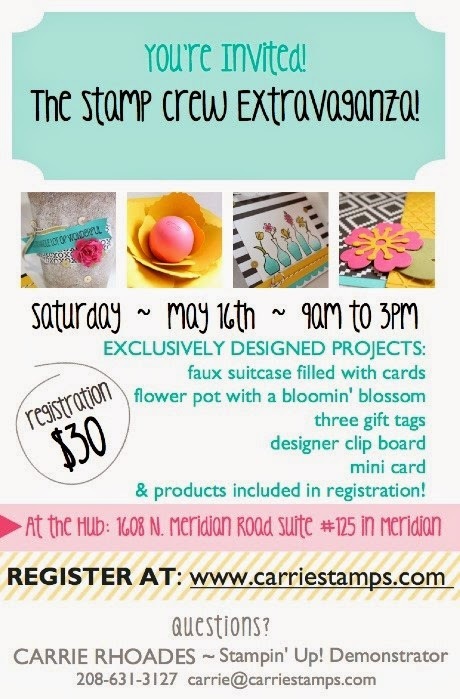 My friend Carrie is hosting The Stamp Crew Extravaganza. It's an all day event with demonstrations and stamping projects (see photo below) and is only $30! If you are not able to attend, she is selling kits for the same price.